Here is a old favorite Christmas tune to get you in the Christmas cheer. I saw Mommy kissing Santa Claus, underneath the mistletoe last night. She didn't see me creep down the stairs to have a peep; she thought that I was tucked up in my bedroom fast asleep. Then, I saw Mommy tickle Santa Claus Underneath his beard of snowy white; oh, what a laugh it would have been If Daddy had only seen Mommy kissing Santa Claus last night. 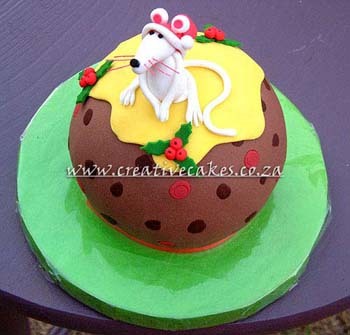 A Christmas Mouse Cake will cheer up your house and make your Christmas Merry. This Mouse Cakes made of juicy fruit and can be served with custard or jelly.